Ramsgate. A link to Sydney’s early history, cafes and coffee, a lively mix of old and new on the streets before you. These sights and more on your door step so what's holding you back? If the answer is back or neck pain than you need Sydney Wide Chiropractic who can give you renewed vitality and a new lease on life. Simply put, it is our mission statement to provide you with a mobile and functional nervous system that is in harmony with your spine, resulting in a flexible and mobile body that you have been waiting for. A well balanced spine and nervous system is the ultimate gift and it works best when given the proper chiropractic care that it needs. We understand that you want natural and effective treatment modes that don’t break the bank and as more and more people are looking to chiropractor specialties to relieve them of their pain, we stand as the leaders in our industry. For the past 11 years and counting we have stood tall as the number one chiropractor in Ramsgate and can provide treatment programs that will be of benefit to you in relieving your pain today and opening up a new lifestyle of health and vitality going forward. You deserve to the best version of you and that's where our responsibility begins, you want a chiropractor in Ramsgate who is experienced and carries out safe and affordable treatment, this is our commitment to you. Your trust in us is returned with a reliable and responsible service that will make a difference in your life. Your health is your most valuable feature and making the choice to turn to chiropractic care is easy, when you’re also looking for the best value health care professional available, we make the choice even easier. 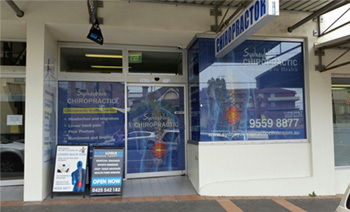 So if you're ready to wake up to a better, brighter tomorrow and make your pain and discomfort a thing of the past then pick up the phone and contact us today on (02) 9529 4009 or email us at info@sydneychiropracticclinic.com.au and organise a face to face meeting, we are waiting for you.